← Hubert Van Eerd of the Thames Horizon Club Reports their Summer Season Ends!! Pipher parades his NEWFIELD; McCormack parades his FIELD MARSHALL!! Stan McCormack Speaks: I just re-read Gary’s Story about his somewhat unique NEWFIELD Tractor. (https://theshuffler.net/2018/09/27/did-your-working-experience-prepare-you-for-retirement-tell-your-story-gary-pipher-shares-his-story/) I say that with no malice, rather with respect to the many tractors both Gary and I have operated. (Driven). Unfortunately, the tractor I am going to tell you about was never, to my knowledge, airlifted by a Helicopter. My tractor was a FIELD MARSHALL!! The FIELD MARSHALLs uniqueness came from the way you started it!!! All right tractor aficionados, read on, and tell me if you have ever operated a tractor that was started by a SHOT GUN SHELL!!!!!!! 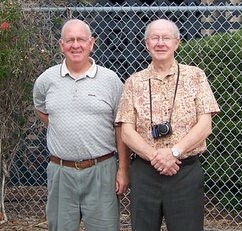 I now give you a little ‘lead up” info to my article: “Our” is Don Welch and Stan McCormack. “SAM” is Stan McCormack’s nick name in the 50s. We went “West” to help with the Harvest!! Our destination was Saskatoon, Saskatchewan; and in particular a relative of Don’s. As indicated above, we came west to “help with the harvest”. With that in mind we both took a job on a large farm, Don on one, I on another. I thoroughly enjoyed both the work, with which I was both comfortable and accustomed. I was driving a Field Marshall Tractor working a Huge, Huge, section of land. One aspect that I was both uncomfortable and unaccustomed was operating the Field Marshall. To start the tractor, one placed a shot gun shell in a cavity near the top of the radiator and then hit it with a hammer!! I kid you not!! The farmer and his wife treated me like their son, bringing lunch to me in their new 98 Oldsmobile; and picking me up at the end of the workday. One did not drive the Field Marshall into the farm house. Farming was “good” for my employer. As I recall they spent their winters in Arizona, just one indication of their opulence; the other was they owned their own small aircraft. Don and I had been “helping with the harvest” for less than a week when Don arrived at my place of work stating that “We are going back to Saskatoon”!! I cannot recall the precise reason(s) for this reversal but remember the first of the two stories above!! We do indeed return to the city where we just as quickly obtain employment, this time in the construction industry. Don’s father, F.F. Welch, owned a construction company in North Oshawa and Don was familiar with most of the equipment. School mates used to kid him that he drove a bull dozer to public school and for that reason never did make it to High School???? Don got a job driving a dozer pulling a scraper picking up gravel and dumping same into a crusher. SAM got a job driving a centre dump truck, dropping gravel on newly installed gas lines in every alley in Saskatoon. Many western cities have alleys in every street. This is a good idea. In this situation it was not necessary to tear up the main streets to install the gas lines. Alleys existed also in housing developments > remember our home in Winnipeg in 1970, 164 Rouge Rd. We had to haul the gravel down Ave. “A” into Saskatoon, a distance of about 10 miles. Jim Patrick sand and gravel, the pit owner and truck owner, had a good many trucks on this haul. I was, at the age of 15 or perhaps now 16, was by far the youngest driver and as I was so young I enjoyed the job and wanted to do well. The other drivers thought I was doing too well in that I was making more trips per day than the other drivers. One of them reported me to the RCMP who stopped me and asked to see my license. I had a Restricted Chauffer’s License which I obtained the day I turned 15 years old. I cannot recall their line of questioning, if any, but that evening when I turned in my truck, Jim (Patrick) told me that the RCMP constable suggested that I smear a little grease under my nose!! Jim Patrick later became the mayor of Saskatoon. 3 Responses to Pipher parades his NEWFIELD; McCormack parades his FIELD MARSHALL!! Good story and a good challenge from the age of older farming methods and the young men and (boys) who wore the seat out of their trousers on those hard old seats. Very fine remembrance of time past, Sam, the good old bad old days.